Missed the set of most recent links? Scroll down, or find them here. Moving on, I'm going to unveil some new statistics related posts in the future so I wanted to take a few minutes to explain a little bit more about the stats aspect that we do here at Cracked Sidewalks. This will eventually be stickied or constantly reference. If it's rudimentary, then my apologies. If you don't really care about stats, then you've been warned. What does it mean when you say "tempo free stats"? In my opinion, the point of tempo free stats is to provide a consistent method of analyzing basketball teams. Not all teams play at the same pace. As an example, both North Carolina and Georgetown were good teams last year. However, if you look at the pace statistics, North Carolina played at the #5 pace in the country (75.3 possessions / game) and Georgetown played at the #311 pace in the country (62.1 possessions / game). Tempo-free stats treat at each team on a per-possession basis to provide a common denominator for comparison. At a fundamental level, each team can be judged on how many points they score per possession. If you look at the box score from the UW @ Madison game last year, you can figure out each team's possessions and the pace of the game. In a game where Marquette had 70 possessions offensively, that is 35 possessions per half. Just looking at media timeouts, that's about nine possessions on each end of the court between media timeouts. Every possession counts. What are Offensive Efficiency, Defensive Efficiency, and Efficiency Margin? Offensive Efficiency (ORtg) is how many points a team scores per 100 possessions. It's really just a cleaner way to look at points per possession, but the two terms are interchangeable. A team with an Offensive Efficiency of 116 also scores 1.16 points per possession (PPP). That team is also Marquette. The best team at Offensive Efficiency in the nation last year was North Carolina, who averaged an ORtg of 126 (or 1.26 PPP). Defensive Efficiency (DRtg) is the same view of the world from the defensive end, and it answers the question "how many points per possession does a team allow?" The best team at Defensive Efficiency in the nation last year was Kansas, who had a DRtg of 82.8 (or 0.83 DPPP). Marquette's Defensive Efficiency was 87.8. Efficiency Margin is as simple as the difference between Offensive Efficiency and Defensive Efficiency. If you look at the Pomeroy Ratings, they are derived on the basis of Efficiency Margin. Is it any surprise that last year's NCAA champion (Kansas) was #2 in ORtg and #1 in DRtg? Or that Memphis was right behind? Note that Marquette was actually the #11 team according to Pomeroy, and that there are plenty of familiar names both in front of and behind MU. Why should I care about any of these stats? Great question. Short answer is you don't have to, but if that's how you feel you probably stopped reading a while ago. A longer answer is that traditional stats are somewhat flawed because they don't allow for a common ground by which to compare teams. Going back to the earlier example, we know that both Georgetown and North Carolina were good teams last year. However, a comparison of their box score statistics (like how many points they score per game) isn't objective because the two teams play at vastly different tempos. Tempo-free stats level the playing field. 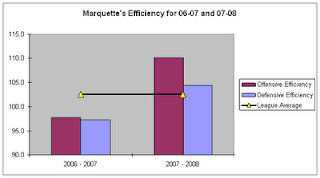 Taking it further, using the objective measures allows us to better understand how well Marquette is playing. Here is a view of Marquette's Offensive Efficiency and Defensive Efficiency for the last two years against Top 100 Opponents only. Unlike the Pomeroy Ratings, I actually think that only looking at Top 100 opponents (or conference play only) is a better representation of how good a team is. It eliminates the grade inflation that comes from beating up on cupcakes. So from even this simple view of the last two years, we have a decent understanding of the last two teams. The 06-07 team was very solid defensively, but well below average offensively. If you don't believe me, try and remember how long it took this team to score in the NCAA tournament against Michigan State. In addition, their efficiency margin was very slim, so this team should have been about 0.500 against Top 100 opponents (they were 10-9). The 07-08 team was much better offensively against Top 100 Opponents, and they were also better than league average. The defense last year was a little bit worse than the 06-07 team and also worse than league average. However, this team's efficiency margin was also much better and they should have won between 13-14 games against Top 100 opponents. (As it turns out, they underachieved at 12-10). Now that we have this basic understanding, we can dig even further into how well a team is playing on the Four Factors (that's part two). The detailed analysis comes from understanding which players are contributing the most or how well the team is playing over time. One can even predict how well two teams will match up. Again, my apologies if this is too simple for some folks. For other readers, I hope it provides a better understanding of the basics of tempo-free stats. A lot of people can get hung up on these types of stats, but really all they do is break the game down to very fundamental concepts. Everything is about a possession, and every possession counts. Even when we get into the Four Factors (Part Two), that's also about looking at the game's fundamentals of shooting, rebounding, turnovers, and free throws.